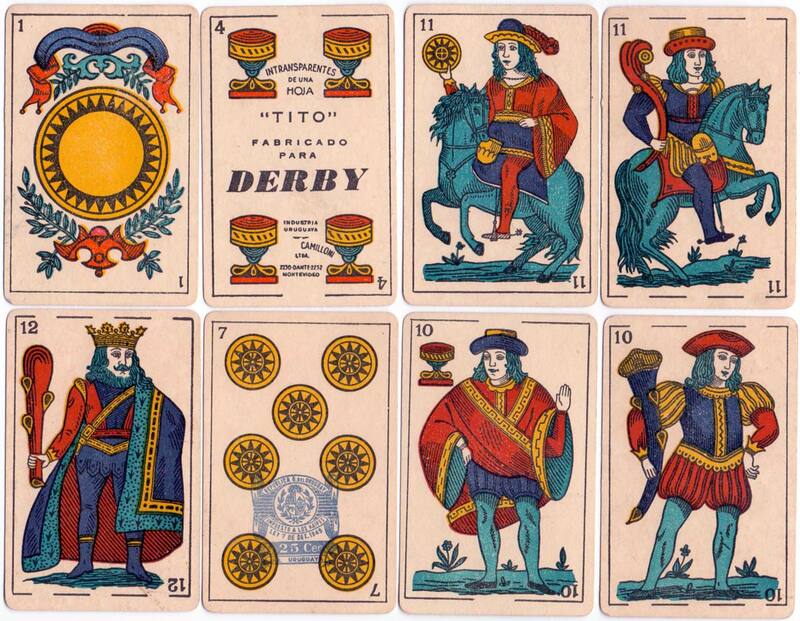 The box (shown right) and the four of cups show young Miguelito setting off to school at a brisk march. The manufacturer’s name given on the box is 'Camilloni Hnos’ wheras on the four of cups it is 'Camilloni Ltda’. The latter looks as though the first part of the name has been removed: the company had recently changed name from ‘Flaiban & Camilloni’ to ‘Camilloni Hnos’ and then again to ‘Camilloni Ltda’. 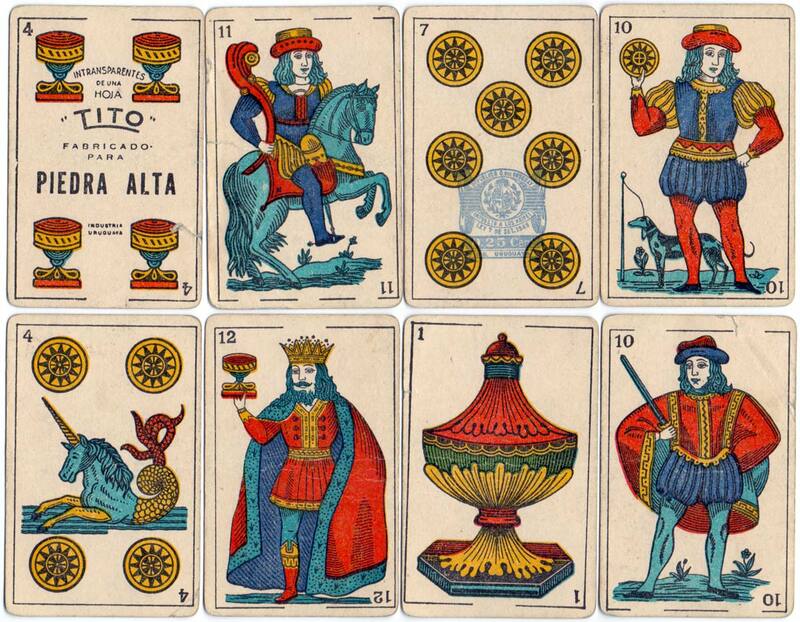 The same cards were also produced with the name "Tito" on the four of cups. 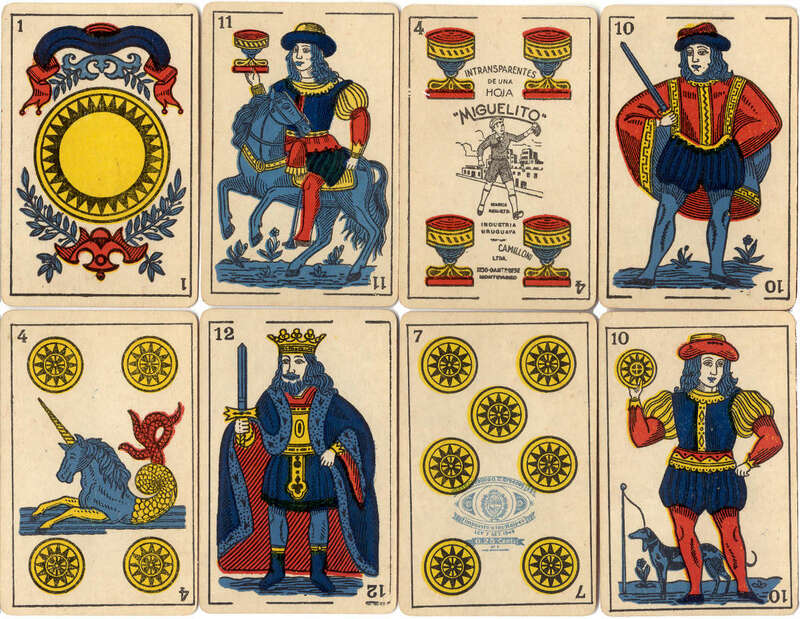 The cards are of the standard Spanish-suited 'Parisian’ pattern (Tipo Francés) based on models exported to South America by French manufacturers during the nineteenth century, eg Alphonse Arnoult, B.P. Grimaud, etc. with a sea monster on the four of coins. The tethered hound on the jack of coins is another characteristic. The seven of coins has the blue 25 centésimo tax stamp which was applied to playing cards in Uruguay at this time (1949-60). 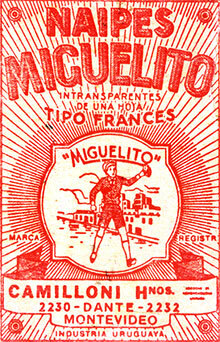 Above: Naipes ‘Miguelito’ manufactured by Camilloni Ltda, Montevideo, c.1950. 40 cards in box. Above: Naipes ‘Tito’ manufactured for ‘Piedra Alta’ by Camilloni Ltda, Montevideo, 1950s. 40 cards in box, same Parisian Spanish pattern designs. It is a curious feature of this pattern that the king of cups has only one leg! Above: Naipes ‘Tito’ manufactured for ‘Derby’ by Camilloni Ltda, Montevideo, 1950s. 40 cards in box. Camilloni Hnos also produced Naipes ‘Tela de Araña’.